Shindo-Muso-Ryu was founded about 380 years ago by Muso Gonnosuke Katsuyoshi. 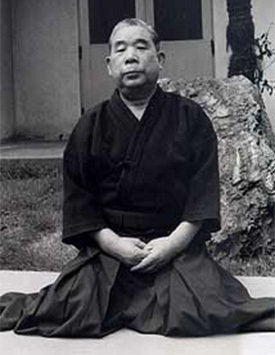 Tradition says that Muso Gonnusuke Katsuyoshi mastered the secrets of Tenshinshoden-Katorishinto-Ryu and Kashima-Shin-Ryu under Master Matsumoto Bizennokami: he was so skilled that was never defeated in numerous maches with famous swordmen. But one day he fought with a Master swordman, Miyamoto Musashi, in Banshu Akashi: caught in "Jujidome", the mysteries of Musashi's Niten-Ichi-Ryu, he could neither advance nor retreat and was defeated. Since then Gonnosuke had an errantry life, visiting various places to have matches and devoted himself to the conquest of Musashi's Niten-Ichi-Ryu Jujidome. Several years later he went to Chikuzennu-kuni (Chikushi District, Fukuoka Prefecture), climbed up the holy Homan Mountain, and confined himself in Kamado Temple for 37 days. As a result of his intensive prayer on the last day a child appeared in his dream and gave him a divine message: "Try to get the pit of the stomach (sui-getsu) with a log". Using this message, Gonnusuke made a stick of oak of 4-Shaku 2-Sun 1-Bu (128 cm approx.) in length and 8-Bu (2.4 cm) in diameter. He used it as a weapon and originated Jodo in which three martial arts were synthesized: Yari (spear), Naginata (long-handled sword) and Tachi (long sword). Tradition says that he finally defeated Musashi's Jujidome. Later Gonnosuke was engaged as a master in the Kuroda Clan (Fukuoka) and trained several instructors: Jodo war handed down as a Martial Art which was not allowed to be taken out from the clan. Jodo was introduced to the public for the first time in 1871, in the Restoration of Meiji Period. The 25th Master Shimizu Takaji Katsuyasu, disciple of the 24th Master Shiraishi Hanjiro Shigeaki - warrior of the Kuroda Clan -, went up to Tokyo for the popularization of Jodo, while at Fukuoka Otofuji Ichizo Katsunori has actively made efforts for succession and developement of the school up to his death in 1998.